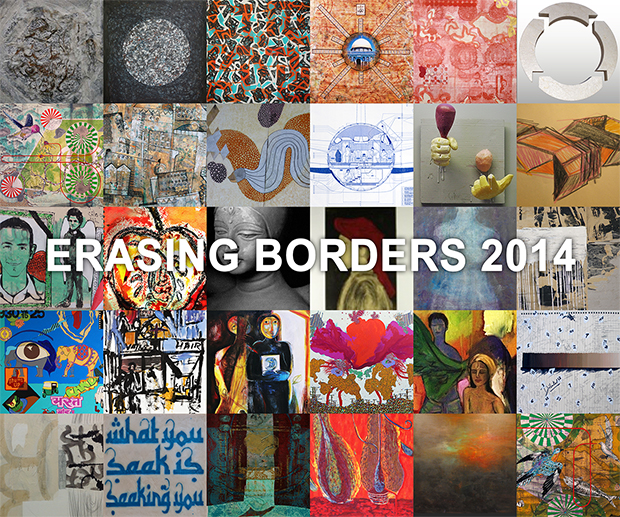 The Indo-American Arts Council’s 11th Annual Erasing Borders Exhibition of Contemporary Indian art of the Diaspora features work by 29 artists whose origins can be traced to the Indian subcontinent. This group of multinational and inter-generational artists, curated by Vijay Kumar, reflects a broad range of life experiences and aesthetic values. The artists interpret diverse subject matter—figurative, abstract and conceptual—in a variety of media, including painting, drawing, printmaking, photography, video, sculpture and installation. The resulting works often meld Indian and Western ideas about color, form and subject. Twenty million people of Indian origin shifted countries in the 20th and 21st centuries. Implicit in the term Diaspora are the concepts of change and adaptation. Cultural dislocation can produce unexpected and powerful results. Subject matter is often drawn from the country of origin, while many of the artistic decisions and political concerns come from the artists’ new-found situations. Many Indian artists went abroad after India’s independence from British rule. These grappled with dual aesthetic concerns (modernity versus tradition), and with the complex issue of identity. Diaspora artists had to create an authentic artistic language possessing Indian aesthetic components in order to be taken seriously by critics, as well as to reconcile issues associated with being minorities. Today’s diaspora artists are scattered across the country and are more socio-economically and religiously diverse than their predecessors. Artists of the South Asian Diaspora are working to make themselves heard in an art world that is at once more competitive and more receptive to non-Western art than ever before. This exhibition seeks to transcend the borders that confine and control preconceived definitions of Indian and Western art. The exhibition features works by: Niamul Bari, Shanthi Chandrasekar, Bivas Chaudhuri, Bushra Chaudry, Nandini Chirimar, Tarik Currimbhoy, Reet Das, Delna Dastur, Anujan Ezhikode, Mustafa Faruki, Sunil Garg, Reeta Gidwani Karmakar, Mansoora Hassan, Mumtaz Hussain, Smrita Jain, Renuka Khanna, Chandrika Marla, Parul Mehra, Rahul Mehra, Alka Mukerji, Nipun Manda, Avani Patel, Arun Prem, Antonio Puri, Sangeeta Reddy, Amin Rehman, Pinku Roy, Tara Sabharwal, and Md Tokon. The Indo-American Arts Council is a 501 ©3 not-for-profit arts organization passionately dedicated to promoting, showcasing and building an awareness of artists whose heritage hails from the Indian Subcontinent in the performing arts, visual arts, literary arts and folk arts.